Whether you're a collector of fine porcelain figurines or an afternoon tea time enthusiast, antique English tea figurines are heartwarming collectibles you won't be able to resist. The afternoon tea party is a favorite traditional activity that most people associate starting in Britain and spreading throughout the globe. Tea time is usually a mid to late afternoon break involving snacks, good gossip and a great pot of tea. This British tradition is often credited to the whims of one woman, Anna, the seventh Duchess of Bedford, in the year 1840. At the time, dinner was served traditionally late, around 8:00 PM. To help curb her appetite, the Duchess would request a tray of tea with bread, butter and some cake be brought to her room around 4 PM. This became a daily habit and eventually she began inviting friends to join her. Thus, the tradition of tea time or afternoon tea was born. Since the idea of late afternoon tea and a snack began, it has evolved into a more formal gathering, where women would dress up in fancy dresses and hats. Bread and butter evolved into fancy, bite-sized sandwiches and pastries. Of course, the focus of attention has always been the tea. However, it could be debatable as to whether the most important element of afternoon tea is the tea itself or what the tea is served in. When it comes to the tradition of afternoon tea time, it's mostly about presentation. Antique English tea figurines are porcelain collectibles that capture the essence of British culture. 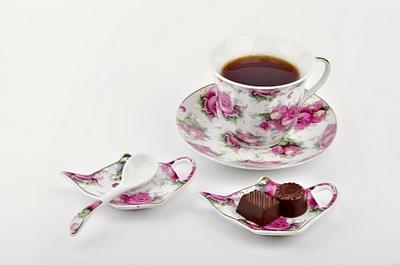 Royal Doulton is a well-known English producer of tableware, crystal glass and fine porcelain figurines. In it's early days, this family owned business established the world's first stoneware pipe factory and eventually went on to become Britain's top manufacturer of sanitary ware. The company was able to capitalize on the sanitation revolution during Queen Victoria's reign, from 1837 to 1901. Soon Doulton expanded into artistic pottery with ornamental commemorative and tableware products. Doulton was a pioneer in porcelain making, having local artists and designers who experimented with a variety of materials and glazes. Big names such as the Barlow family, Frank Butler, Mark Marshall, Eliza Simmance and George Tinworth ensure their products command increasingly higher prices. The Royal family itself soon took note of the Doulton name. In 1901, king Edward VII, granted the Burslem factory the Royal warrant. This meant the company could adopt the logo of the British lion and a new classic brand name, Royal Doulton. The largest Royal Doulton figurine took over 160 hours to hand paint and costs more than £14,000. The company's collectibles are so widely popular that the Royal Doulton international Collectors Club was launched in 1980. Royal Doulton may no longer be a family business, however, the company has a "family" of English brands, including Minton and Royal Albert. In 2005, these historic names became part of the Waterford Wedgwood group. A delightful figurine from Royal Doulton is the "Teatime" figurine. This figurine stands 7 1/4 inches high and was designed by M. Nicholl. It depicts a sweet little old lady in a humble brown dress carrying a teapot in one hand and a teacup and saucer in the other. This figurine was first released in 1972. Although afternoon tea time has become a timeless tradition in British society and has been adapted by other cultures as well, finding antique figurines that capture this tradition in fine porcelain detail is becoming exceedingly harder. These particular collectible figurines are unique and hard-to-find. If you like collecting porcelain figurines and you're lucky enough to come across an antique English tea figurine, it might be well worth the money.